WASHINGTON -- On Tuesday, Hillary Clinton took a few minutes away from her texting (and all her other duties as secretary of state) and met with the two guys who have turned her into the latest Internet meme. In less than a week, the blog "Texts from Hillary" has become an online sensation, boosting Clinton's public image in the process. As Benjy Sarlin of TPM wrote, "When she was running for the Democratic presidential nomination, Hillary Clinton was parodied as drab and calculated, especially compared with young and vigorous Barack Obama and winking and fresh-faced Sarah Palin. Now, she’s fueling Internet jokes based on her own brand of badass cool." Stacy Lambe and Adam Smith, the two guys behind the site, said they received an email from a member of Clinton's staff on Monday afternoon, out of the blue. "We didn't even believe it at first," said Smith. "Stacy and I IMed each other at the same time, basically saying, 'Oh my god, this email!'" The staffer invited them over to the State Department, saying the secretary loved the site and wanted to meet them. Her staff also submitted Clinton's own idea for a post to the site, which went up on Tuesday. In it, Clinton calls out Smith and Lambe for their creation (and makes a scrunchie joke). Smith said that the submission was from Clinton herself -- although she may have had some help on it -- and that they talked about it with her at the meeting. She told them that her favorite post was the one with Ryan Gosling. "Her staff is a delight," said Lambe. "Everybody was really nice and really excited about what's happened over the past few days. Of course, Hillary Clinton thought it was hilarious and had a good laugh and was very nice and welcome -- and very generous to take a few minutes of her time to take some photos with us." "I would just say that her meeting with us proves the point that we were trying to make with the site," said Smith. 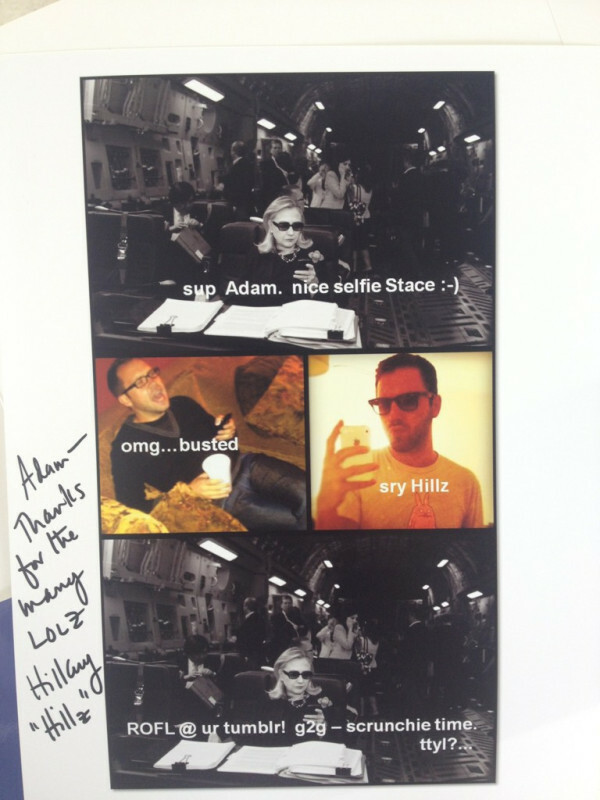 Clinton also gave each of them signed copies of her "Texts from Hillary" submission.